Today is the most beautiful warm and sunny day we’ve had so far this year. 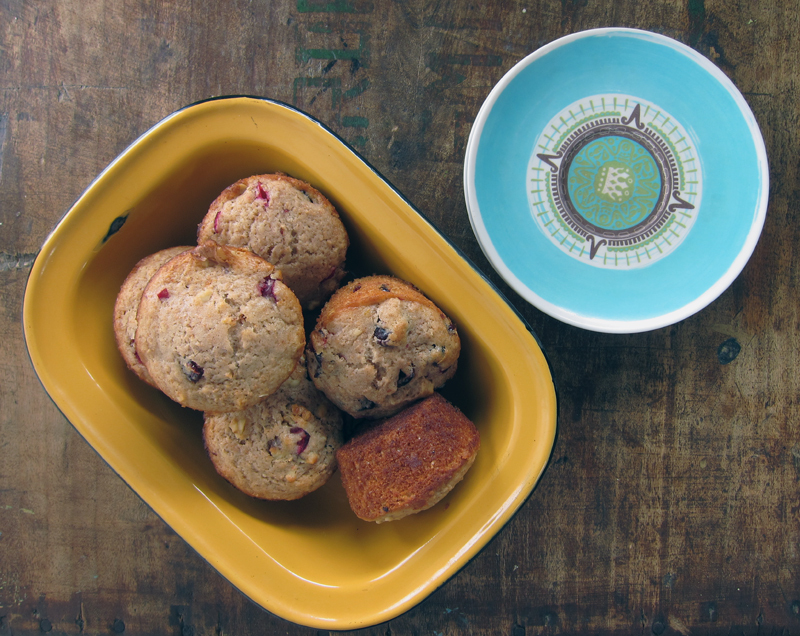 Instead of being outside (scrubbing my balcony clean), or riding my bike with some friends, I’m here, indoors (but with my windows fully open), writing about muffins. I also have plans to start working on taxes that are due at the end of the month and work on some client work. It’s fun spring times, my friends. Last Sunday morning I was in a baking mood and decided not to go with scones since I had made a batch fairly recently. So I went with the other breakfast favourite, muffins. I had a few navels, blood oranges and a lemon to use up and I decided to try a recipe I had bookmarked on the Post-Punk Kitchen. 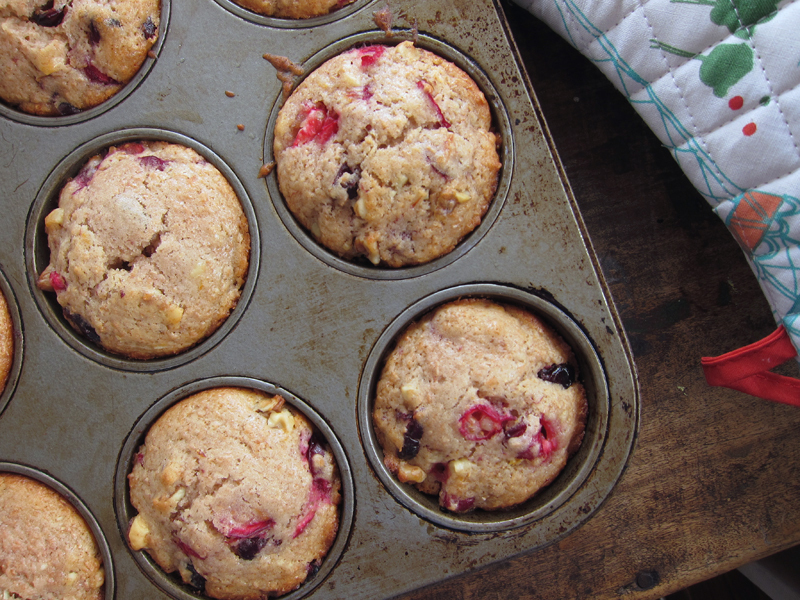 They looked simple to make before my first cup of coffee so I made a few adjustments to the recipe based on what I had and baked up 12 delicious muffins. They don’t have big heady tops, but looks don’t matter here. These are mighty tasty breakfast treats. The star of the show is the citrus. 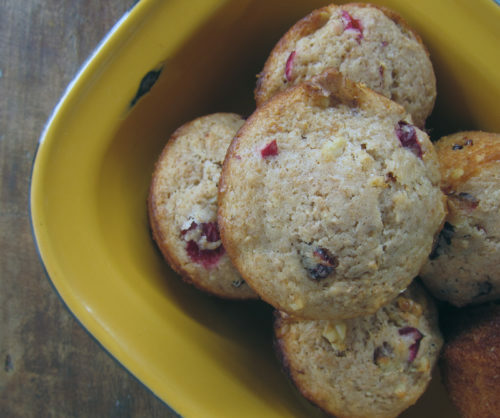 It really does pop with brightness and flavour and so much better than the dry & bland orange-cranberry muffins you’ll find at the corner coffee shop. These are moist and everything a good muffin should be. You can swap in just regular old oranges for my citrus blend, or experiment with meyer lemons, grapefruit or limes. At first I thought reducing the sugar would be a good move, but the lemon juice does make it sharp and the sugar does add a good balance. That said, if you skip the lemon juice and go with a sweet orange, by all means use less sugar. You can easily substitute in spelt flour or whole wheat or just use all-purpose instead of adding in some wheat bran. That tiny addition was my nod to health, ‘cuz sometimes you can only do so much. Like I mentioned above, use less sugar if you’re skipping the lemon juice and feel free to substitute some whole wheat or spelt flour for the all-purpose. Lightly grease a large 12 cup muffin tin with oil. Preheat oven to 375F. In a large bowl, whisk together the flour, wheat bran, sugar, baking powder, baking soda, salt and orange zest. Add in the juice, olive oil, vanilla and almond extracts and stir until just combined. Dump in the cranberries and walnuts, if using, and stir until well-distributed. Spoon batter into each cup, about 3/4’s full and bake for 23-25 minutes or until a cake tester inserted in the centre comes out clean. Remove from oven and let cool slightly before removing from the pan. Let muffins cool completely on racks. Citrus is always such a nice way to wake up! 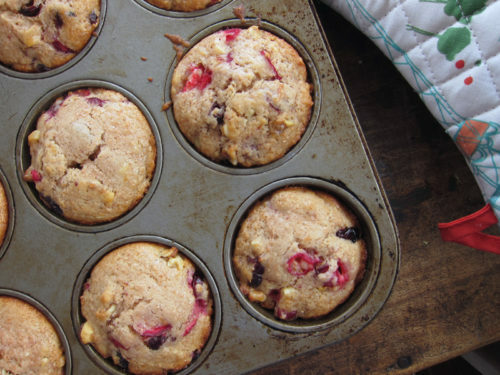 These muffins look lovely! 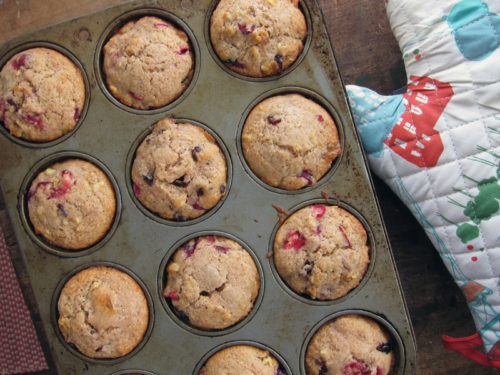 These muffins look delicious, love the citrus and cranberry combination. It’s funny how the weather affects how we feel physically and emotionally. These sound so lovely and aromatic! Yum! RMW, these are so tasty!